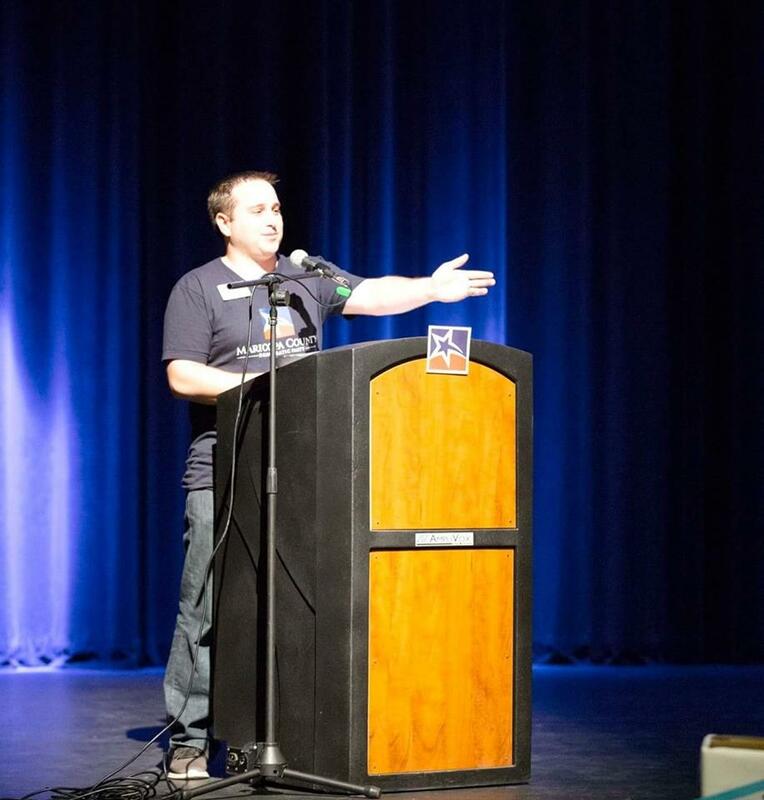 About 700 excited and enthusiastic Democratic activists, including many candidates, precinct captains, and Legislative District chairpersons, filled the auditorium at the Performing Arts Center of Horizon High School in Paradise Valley on June 30 to attend the Summer Convention of the Maricopa Democratic Party. They heard speakers including the County Party Leadership, Maricopa County State Representatives Kelli Butler and Mitzi Epstein, House Representative Ruben Gallego, the three Democratic Gubernatorial Candidates (Farley, Fryer, and Garcia), Maricopa County Recorder Adrian Fontes, and Guest Speaker Senator Jeff Merkley of Oregon. 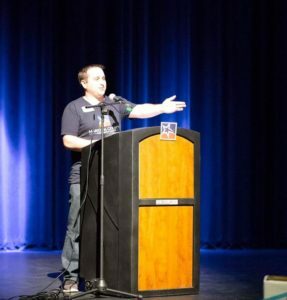 Maricopa County Democratic Party Chair Steven Slugocki speaking at June 30 Maricopa County Summer Convention; photo courtesy of Maricopa County Democratic Party. He happily reported that the Democratic Party has surged in growth since 2016, citing examples of the quadrupling in the number of Precinct Captains in some Legislative Districts (with LD 18, for example exploding with 254 of which I have to disclose I am one) and legislative offices. Slugocki also relayed that there has been a surge in the number of candidates. In 2014, the Democrats recruited 55 people to run and there were some positions where Republicans ran unopposed, today there are 75 people running and all legislative offices are being contested. LD 23 was singled out for being the district that gathered the most ballot signatures and LD 12 for the most voter registrations. Read: LD 23 State House Candidate Eric Kurland sees 2018 as a Referendum on Public Education. The packed parking lot: Arriving at the Convention well before it began, the parking lot was already fairly filled. It was also striking to see the bumper stickers on many of the cars. There were many SOS (Save Our School) stickers and you can tell where the drivers lived by the local candidate bumper stickers on their vehicles. A very well-organized and managed check-in process that directed the attendees to the gathering for candidates and ballot initiatives and the cafeteria as well as monitoring when it was time to venture to the auditorium for the convention. The gathering place for candidates and ballot initiatives before the meeting was filled with vibrant energy and positive interaction. Virtually all the major candidates were represented by their teams with some of them there to meet people and answer questions. Some of the candidates present at the pre-convention gathering were Dr. Hiral Tipirneni, Kiana Sears, Kathy Hoffman, Jennifer Samuels, Jennifer Jermaine, Jennifer Pawlik, Kristen Dybuig Pawelko, Jennifer Longdon, Anita Malik, Heather Ross, and Eric Kurland Volunteers for the Invest in Ed, Outlaw Dirty Money, and Clean Energy for a Healthy Arizona were also there gathering signatures in this last week of collecting them. 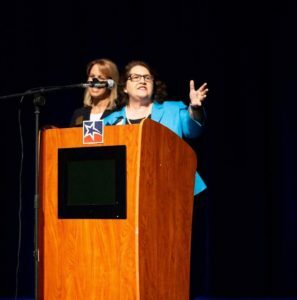 State Representatives Kelli Butler (left) and Mitzi Epstein (right) speaking at the summer convention; Photo courtesy of Maricopa County Democratic Party. Saluting the Red for Ed, March for Our Lives, and Stop Separating Families Unit. Take the Democratic Case for the State and America to all the people, including Independents and Republicans. Fight for Social Security and Medicare. Fight for every child, American, and Dreamer. 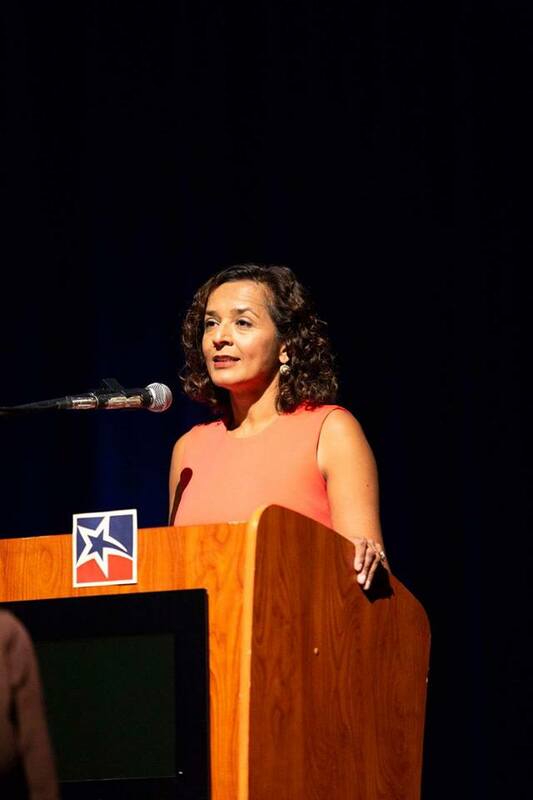 Dr. Hiral Tipirneni speaking at the Maricopa County Democratic Party Convention; photo courtesy of Maricopa County Democratic Party. Gubernatorial Candidate and Senate Minority Leader Steve Farley brought it to the crowd with a passionate oration saying “Are you ready for a Governor that won’t take orders from billionaires from Kansas?” Saying “complacency died in November 2016” and borrowing the Obama phrase “this was our time” stated that we needed a Governor who would invest in education and that “I need you to rise up and help change Arizona,” no matter who was chosen as the Democratic candidate for Governor in August. State Representative Mitzi Epstein, who channeled the crowd to repeat her catchphrase “Who will make Arizona Better? We will.” Speaking with State Representative Kelli Butler, both commended the Red for Ed movement (which also resulted in the crowd chanting “Red for Ed”), they both showed how Democratic leadership at the State Legislature helped steer progressive legislation in opioid prevention, suicide prevention, and school safety. 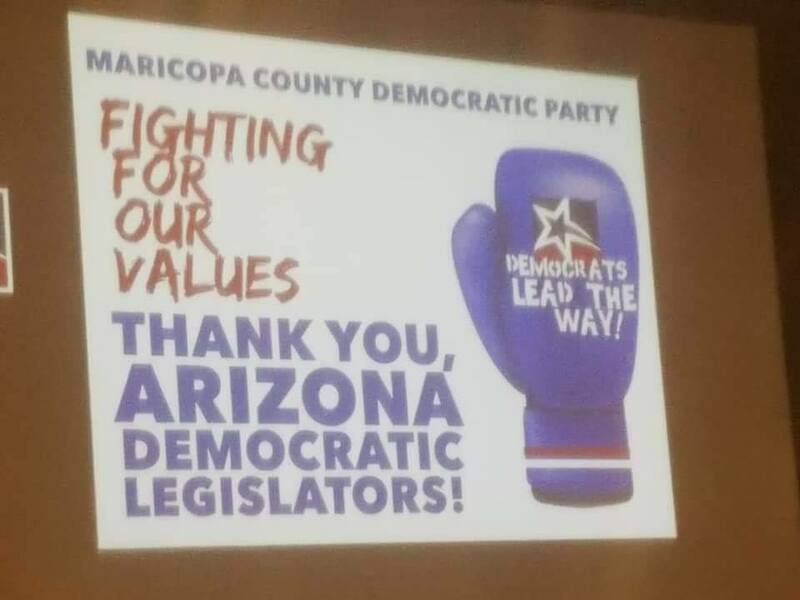 Maricopa County Democrat Executive Director Miguel Medrano called on all the activists to work on promoting the ballot from the bottom up, emphasizing the three goals of voter registration, persuasion, and turnout. Gubernatorial Candidate Kelly Fryer gave an impassioned speech, remarking that “Arizona should work for everyone,” “children do not belong in cages,” “this is about morality (when discussing the plight of some Native American and rural populations that do not have access to running water or broadband),” and “what happened to vision, dreams, and innovation?” (when commenting that Governor Ducey claims we cannot fully fund public education or repair potholes). Championing a bottom-up plan to end poverty in the state. Fryer wants to make Arizona a model for human rights and justice that the whole world can emulate. Joe Downs delivered the Treasurer’s Report and outlined how the contributions delivered to the County Party have been distributed. He also made the request to the audience (this would be repeated by County Recorder Fontes) to help solicit more funding to help continue the Party’s operations. The only potential hiccup in Merkley’s comments was his singling out (endorsement) of Senate Candidate Kyrsten Sinema in the coming election. One of the audience members in the front row had to correct him and point out that there were three Democrats vying for the Democratic Senate nomination at which time Merkley corrected himself. Maricopa County Recorder Adrian Fontes finished the proceedings by repeating the earlier themes, telling the audience that Republican claims of voting fraud are baseless and calling for a groundswell among the people to fight corporate greed and to elect Democrats up and down the ballot. If the enthusiasm and passion of the audience and speakers that gathered for the summer convention is any indication, the Blue Wave, built on both progressive ideas and energy along with a thorough disdain for Republican policies, may indeed be coming.